how to form the present participle? when to use the present participle? 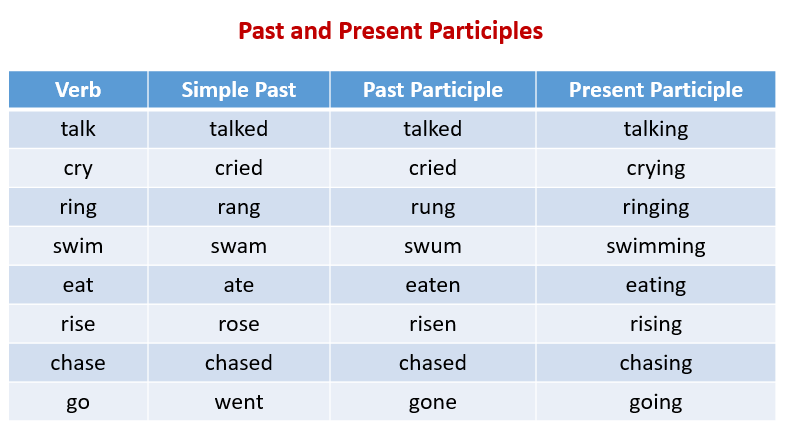 The following table gives some examples of present and past participles. Scroll down the page for more examples and solutions. We form the present participle by adding ing to the verb. When can we use the present participle? We can use the present participle with the auxiliary verb to be to form the continuous tense. We can use the present participle to form the perfect continuous tense. Present participles can also form adjectives. I can hear the bouncing ball. These are his jogging shoes. If the verb has one syllable, one vowel and ends with a consonant, double the last letter before adding ing. If a verb ends with a single l, it is doubled in British English but not in American English. What is a present participle adjective? A present participle adjective is a word formed from a verb using the present participle or "ing" form of the verb. This video shows some examples of present particles used as adjectives. Participle adjectives ending in "ing" and "ed"
• The origin of both participle adjectives ending in ING and ED and the form. • The meaning and use of -ing and -ed adjectives. • Some common examples of participle adjectives. -ing adjectives are the present participle form of the verb. -ed adjectives are the past participle form of the verb. The adjectives that cause confusion for students are the ones that describe feelings and emotion. They cause confusion because both types can be used to describe people but the meaning is very different.